Where can the life coaching course take me? Life coaches are in high demand. In today's world of pressurised modern living many people employ a life coach to help them achieve their goals and move forward with their lives. 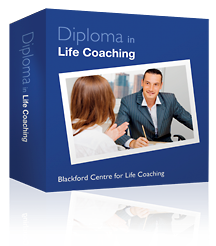 The Diploma in Life Coaching will qualify you to set up as a self-employed life coach and help people achieve their dreams. Your qualification as a life coach means you can set up your own business, work as many or as few hours as you wish, and work from home or in business premises. You can coach clients face to face, on the telephone, by email or over the internet. Internet coaching is becoming more and more popular – all you need is a good internet connection, a computer and a web cam. You and your clients will save on travel costs and time, meaning you’ll be able to take on more clients and earn more money. The Diploma in Life Coaching will give you the knowledge and understanding to motivate and advise clients who need guidance in their lives. You could advise clients individually, or offer group sessions (which means more income for you). Life coaches are often contracted by businesses to advise employees on how to manage their lives better and become more productive at work and in their personal situations. The earning potential for a qualified life coach is limitless as people are willing to pay for a professional to help them see their problems and how to resolve them more clearly.